A few months ago I asked myself: What does a CTO do?. The first step towards answering this question was to offer my time to the team. Today I want to talk about dividing my attention into three priorities: people, technology and business and about creating time to think. In 2011 I lived and commuted from Brighton Beach, Brooklyn, on the subway. I wrote a blog post, Dear California Engineer - Your Commute is Killing You? Move to New York!, which went viral, and topped Hacker News for a solid two days. The post highlighted a few interesting advantages of commuting using public transportation, notably that I could work on the subway, which served as a wonderful time box. At that time my team was just a couple of people and I spent a lot of time doing individual contributor work. My entire commute was about getting things done, or more specifically, about writing code. I’ve since moved back to Manhattan and live across the street from the famous Flatiron building in what was erected to look like a single family mansion 1862. The story of this construction was captured in this Daytonian in Manhattan blog post, including this piece of colorful history: She took from her wardrobe and put on a silk wrapper which Whitney had brought from Turkey, and attired in which, he had often informed her, she appeared to most advantage. She then dressed her hair in a fashion most admired by her lover, and lying down on the lounge, shot herself. The ghost of this woman still positively roams the corridors, according to one of my psychic friends. My new commute takes me downtown 1.8 miles via multiple routes. 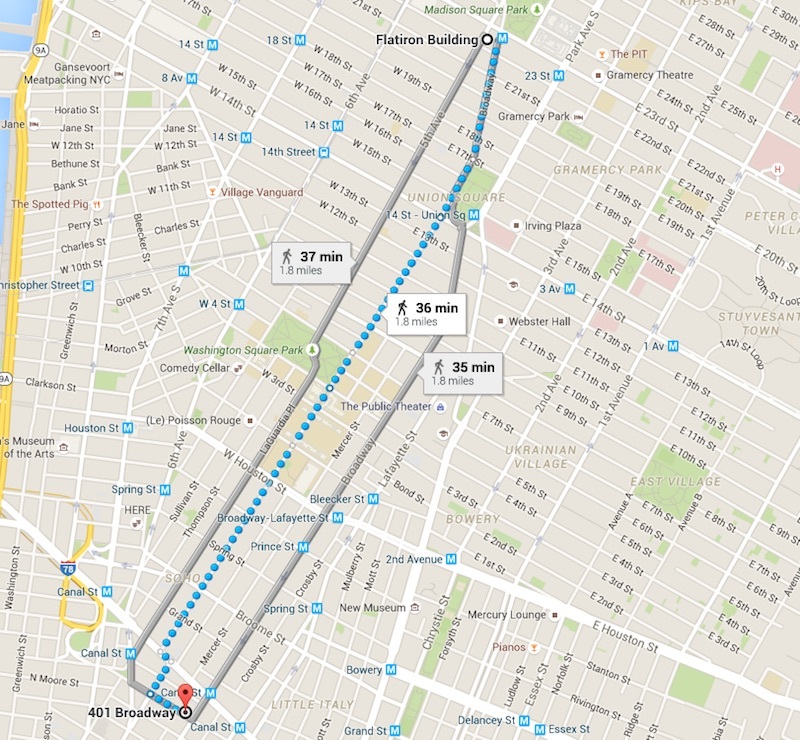 It usually takes 20-30 minutes past Union Square, Washington Square Park, NYU and SOHO. It’s pretty amazing. I also walk back at the end of the day. Following the recommendation from my executive coach I began structuring my walking time. I tend to be barely awake and rather mechanical about my morning. It usually begins at 6:30am, involves some combination of showering, making the bed, feeding the little people and house animals, starting a dishwasher and making myself a hot or an iced espresso depending on the weather. I try not to check e-mail and concentrate on planning my walk to work. My mind is racing with the following thought. What question am I going to ask myself during this half hour walk? First, I choose between people, technology and business. I default to business, because this is my weakest domain or after reading something particularly inspirational (eg. Breaking Smart: Season 1). I usually choose people next and technology last. I try to formulate a question in my head as I begin walking. This usually takes a long time, and sometimes I fail at finding a good question. At other times it’s successful and yields great results. Here’s a concrete example in the people category. Is my Engineering team getting too comfortable and falling off-balance between freedom, pressure and responsibility? There’s some background to this question. After a recent product re-org we were having hard time filling dedicated positions for one of the most exciting business opportunities: auctions. I have personally worked on the early version of the system (read Building an English Auction with MongoDB) and find the domain very interesting and very challenging. I definitely enjoy the parties, but while you can quickly fail and fix in other products, auctions are time-based and final. The auctions system must work every time and must work perfectly. It’s a high stress, high risk and, naturally, high reward environment. It’s not for everyone. I don’t try to answer the question during my commute - formulating the question alone represents success. For the example above it took me a week to collect more data and take some action items. I hedged the bets. I’ve asked two individuals to step up, but time-boxed their involvement to the next two auctions. I am confident that a couple of successful events under pressure and the feeling of accomplishment will help them either reconsider or at least learn the good parts. I’ve also hired a new awesome team lead who is looking forward to the opportunity to succeed and rise with the stakes. I answered the question itself by a yes. I think we do get slightly too comfortable during startup hyper-growth and both take our past successes for granted and have a feeling like we already won. The truth is that the past is a tiny tip of the iceberg of the future and the real opportunity is always ahead of us. We must put ourselves in more uncomfortable shoes in order not to get outpaced by competitors, and I intend to push myself into this uncomfortable spot and lead by example. I now deliberately create time to think and plan to formulate a question in one of the areas of people, technology or business. This is one thing I now do. Creating Thinking Time while Walking to Work was published on August 03, 2015 . See a typo?